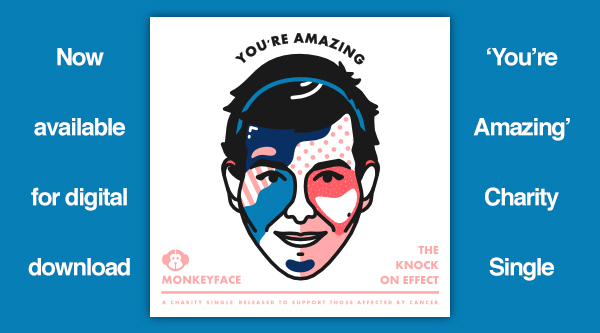 You can now download the Charity Single recorded by Monkeyface on CDbaby here. iTunes download coming soon! Visit the blog for updates. Since being set up by Rosie Kilburn in 2009, TKOE has raised £47,000. We'd like to reach £50k this year. Join us in our £3k challenge and either buy some lovely things from our shop or raise money any which way you can. We also support blood donations. TKOE supporters have donated over 80 units of Blood, Plasma and Platelets over the past two and a half years. Lots of people have donated for the first time too. If you donate, let us know, and we'll add it to our Bloodometer. By spending your money at The Knock On Effect your money goes to these brilliant charities that work to support those affected by cancer. Click the images to be taken to the charity websites, the button below will take you to a secure Paypal page. Thank you!